“Ready Player One” is not just a return to blockbusters for Spielberg; it’s the return of Spielberg in general. Without a doubt, Steven Spielberg is one of the greatest directors of all time. He has created beloved classics such as “Jurassic Park,” “ET the Extra-Terrestrial,” and the “Indiana Jones” franchise. Nowadays, the director has found himself creating more political dramas, rather than the craft he is well known for. Some of those films are “Bridge Of Spies,” “Lincoln,” and his most recent work, “The Post.” Now, he returns to the blockbusters with his latest film, “Ready Player One.” The film stars Tye Sheridan, Olivia Cooke, Ben Mendelsohn, T.J. Miller, Simon Pegg, and Mark Rylance. So, how was the film? 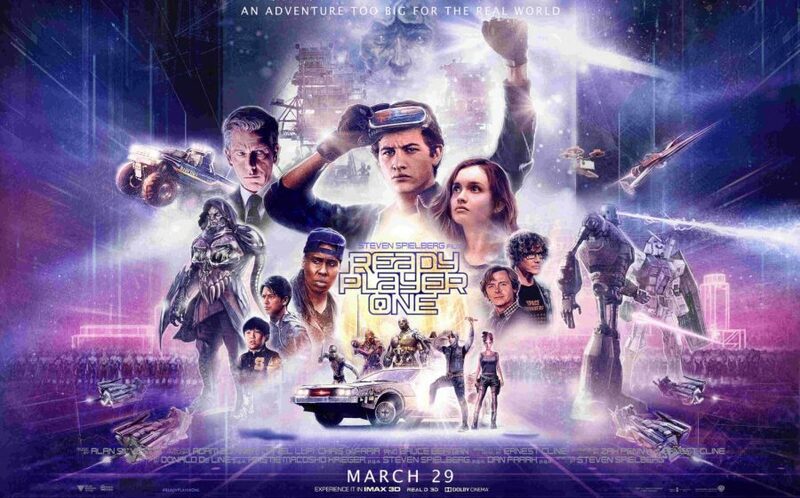 “Ready Player One” details life in the year 2045, where lots of humanity has escaped from the real world and entered a virtual reality called the OASIS. A young boy named Wade Watts finds clues along the way to help him find three keys, which will lead him to find the “easter egg.” Whoever finds the egg will get complete control of the OASIS itself. “Ready Player One” is not just a return to blockbusters for Spielberg; it’s the return of Spielberg in general. His more recent work — while still being great work — hasn’t truly felt like the director we all know and love. This film felt like pure Spielberg, from its adventurous storytelling to its stunning visuals. From a visual standpoint, the film is extremely beautiful to look at. The scenery is vibrant, colorful and fun to explore. Also, the storytelling is adventurous and reminds me of classics such as “Back To The Future” and “Raiders of the Lost Ark.” It’s a story that plays out like a video game, which makes the audiences feel like the players. The results from this are a very entertaining story. And of course, we have to talk about the nostalgic factor of this film. The biggest reason someone might go to see this film is to see some classic characters from all different types of platforms such as movies, TV shows, video games, etc. The nostalgic factor works very well and doesn’t feel forced into the film. The film is self aware of the world it is in and doesn’t feel the need to forcefully put any nostalgic characters to drive its story forward. If you love pop culture and culture from the past few decades, you will love the nostalgic factor of this film. In terms of what I didn’t like, the characters we follow were not fully fleshed out. Their development was very minor and we don’t really feel connected to most of the characters except for Wade Watts, who is our main character of the story. There are also several characters who didn’t have a big purpose and ultimately were throwaways at the end of the day. Also, while Ben Mendelsohn brought in a great performance, his character wasn’t an interesting one to follow or care. Other than that, “Ready Player One” is our long-awaited return of Steven Spielberg. It delivers an adventurous story, vibrant visuals and lots of very well-placed nostalgia. Go watch this film when you get the chance. Let me know in the comments how you felt about the film.